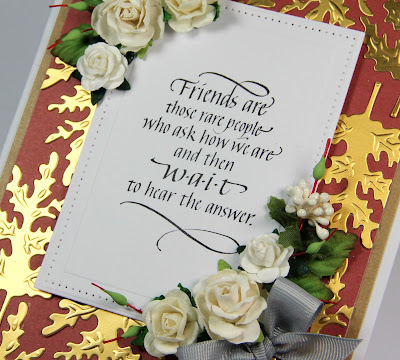 The sentiment was stamped using Jet Black Archival ink on ivory card stock and die cut using Spellbinders Opulent Ovals. 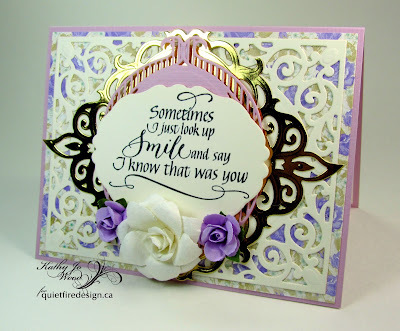 Next lilac card stock was die cut using Spellbinders Fleur de Elegance. Gold card stock was die cut using Spellbinders Majestic Oval. 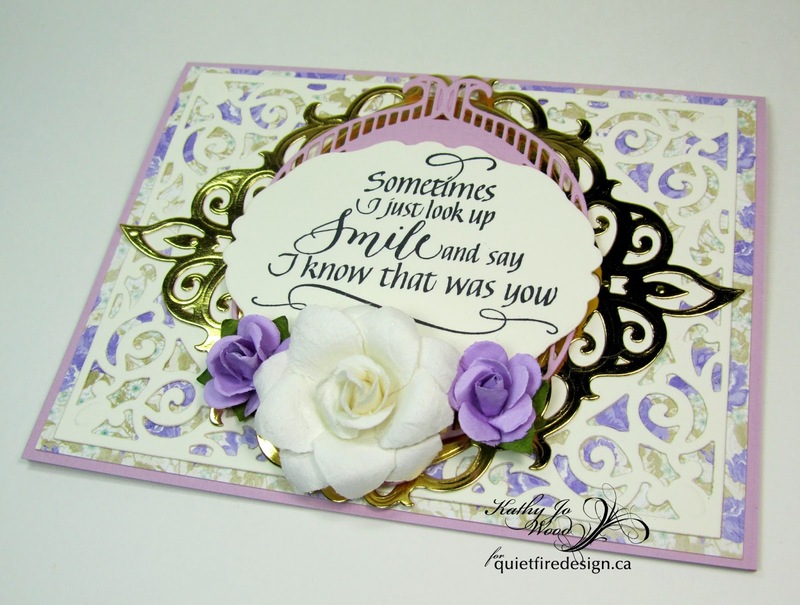 The last die cut: ivory card stock using Spellbinders A2 Filigree Delight. Bo Bunny's rose patterned paper was cut to size and mounted onto a tent fold lilac card. The finishing touch was three roses adhered as shown. The sentiment is so uplifting. 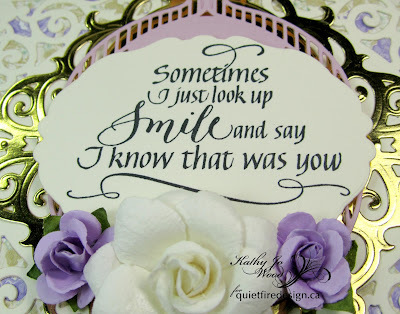 Every time I see it I fondly think of my mom, smile and think of all of those times that she has been with me. It is a heartwarming thought. Thank you very much for stopping by! I do hope you enjoyed the card. 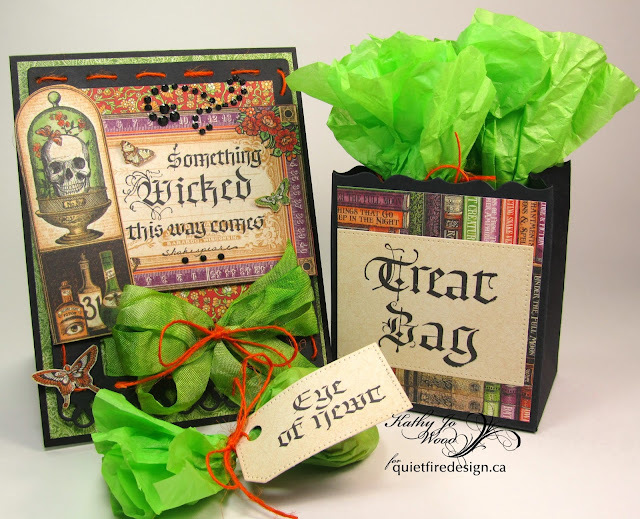 Hello, Connie Nichol here with a spooky Halloween project featuring the Crows and Halloween Wicked stamp sets from Quietfire Design. 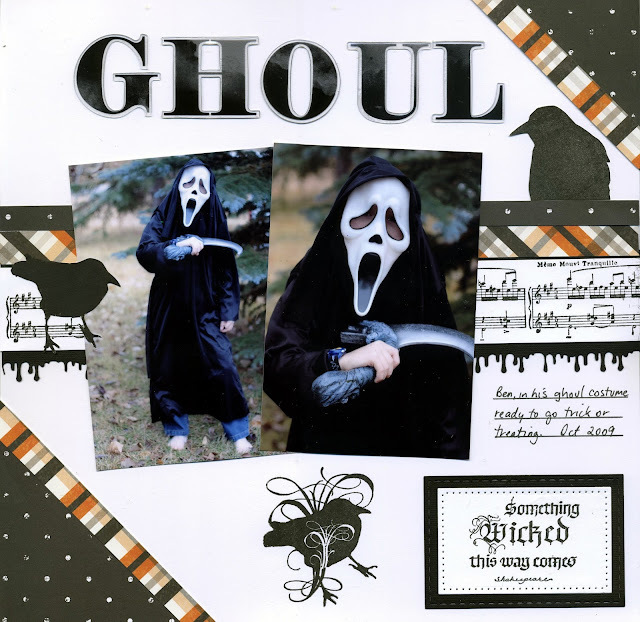 My oldest son went through the 'ghoul' phase when he was 9 and 10 - he wanted only to be a scary masked ghoul with a weapon and nothing else. Sigh. 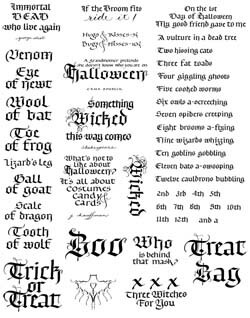 Here's the stamp sets I used - there are 9 stamps in the Crows set! It's nice to have so many stamps to choose from when embellishing a scrapbook page - big and little, crows facing right and left - you're bound to find the perfect option. 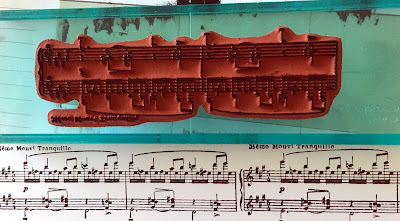 One of my favourite stamps in this set is the musical note stamp. 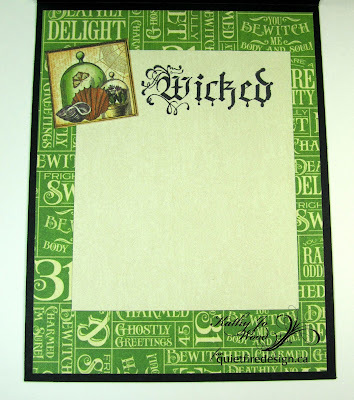 Use it to create card backgrounds, or borders as I did here. Just stamp the musical notes repeatedly below or adjacent to each other. 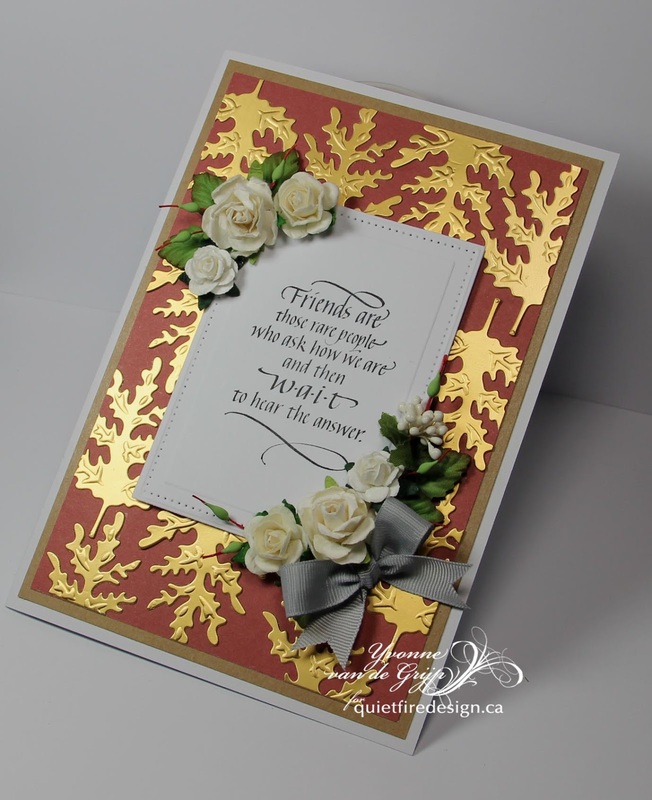 It looks just like another piece of patterned paper, especially when you pretty it up with some cardstock and a border punch. 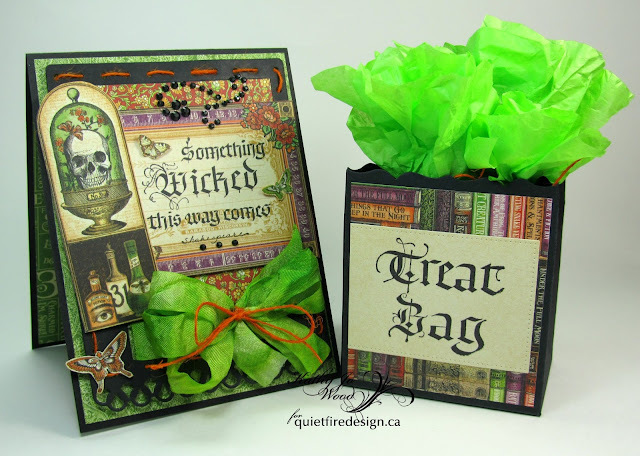 Here's the Halloween Wicked Collection - also a lot of beautiful stamps to choose from. 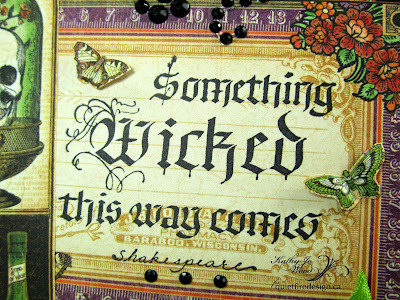 I also made a card while I had everything out..... so easy to stamp on a piece of patterned paper and embellish with a couple of stickers while all the bits and pieces of the creative scrapbooking process are laying about. :-) Happy Halloween!! Supplies Used: Simple Stories patterned paper and stickers, Quietfire Design stamps, Clearsnap Ink, Scrapbook Adhesives by 3L tape runner and foam adhesive, Elizabeth Craft Design stitched rectangle dies, Pink Paislee alphabet letters, Martha Stewart border punch. 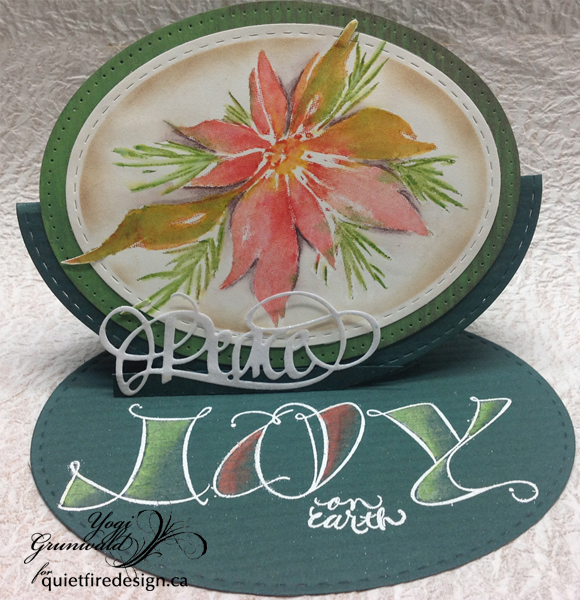 Stamped the poinsettia (Penny Black "Red Star") using my Misti and various Distress colors, misted with water and stamped, then used a damp paintbrush to blend the colors. Dried. Used a Derwent Inktense dark brown watercolor pencil in between the petals to highlight the shadows. Blended with the paintbrush. 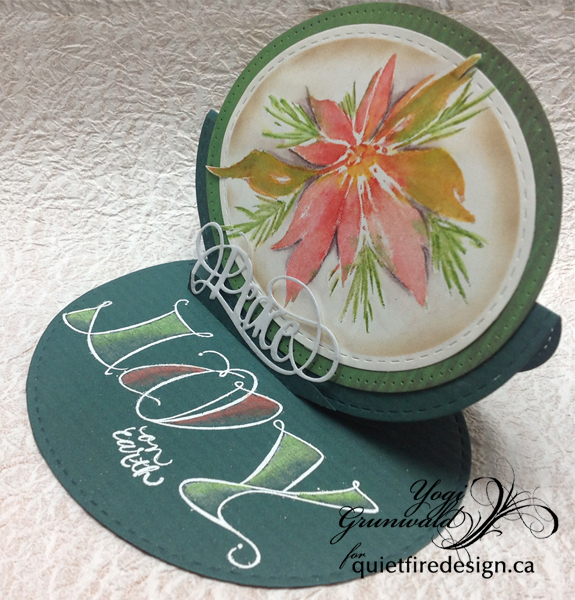 Die cut with Elizabeth Craft Designs "Stitched Ovals" die set, sponged around the edges with a dirty brown sponge. Die cut a slightly larger stitched oval from the dark green cardstock, then painted it with Acrylic daubers "Mowed Lawn", dried and adhered the poinsettia layer on to it then onto the card front. 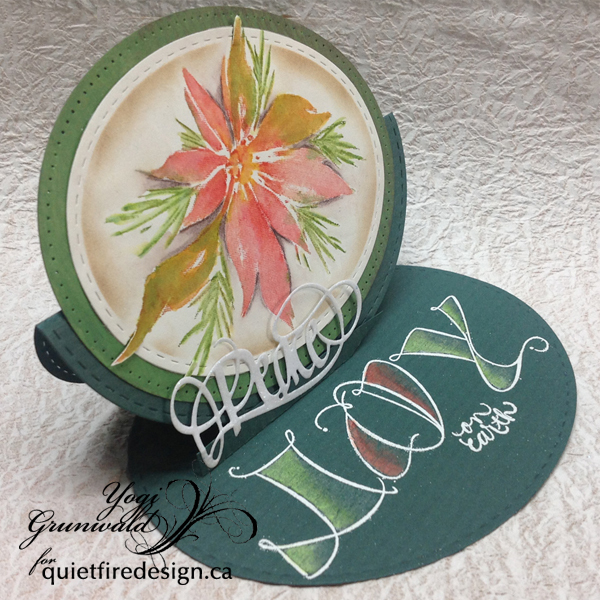 On the floor: Stamped the "Joy" using Distress Picket Fence and embossing with White embossing powder. Colored the letters, partially with a white Prisma colored pencil to lay a foundation on the dark green, then with a light green or red pencil. 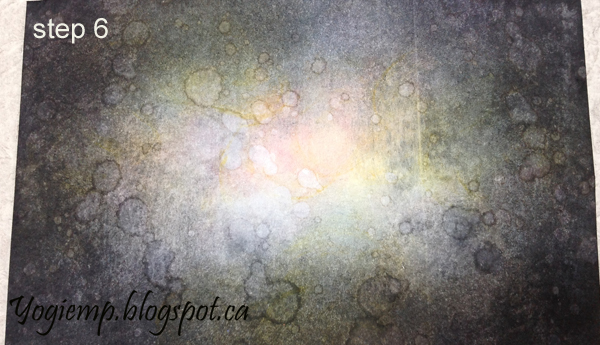 Blended using a Lyra Splendor Blender pencil. 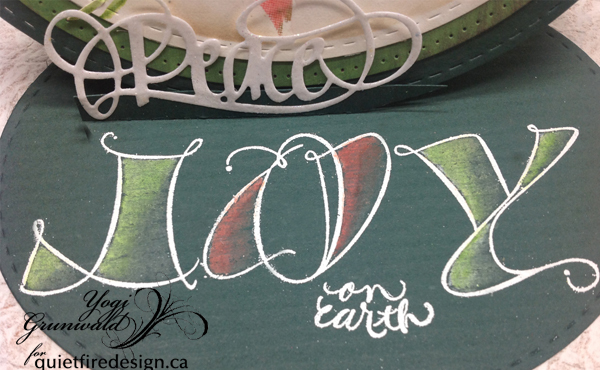 Stamped the "On Earth", masking the rest of the stamp, inking with the white and embossing with the white embossing powder. Die cut the "Peace" (on Quietfire Design HERE) from white cardstock, inked with Versamark and embossed with Pearlescent embossing powder. Adhered to a scored piece of dark green cardstock to act as my stopper. Isn't this a beautiful sentiment! Good Morning, this is Selma Stevenson today. I'm sure any friend would love to receive this friendship card. 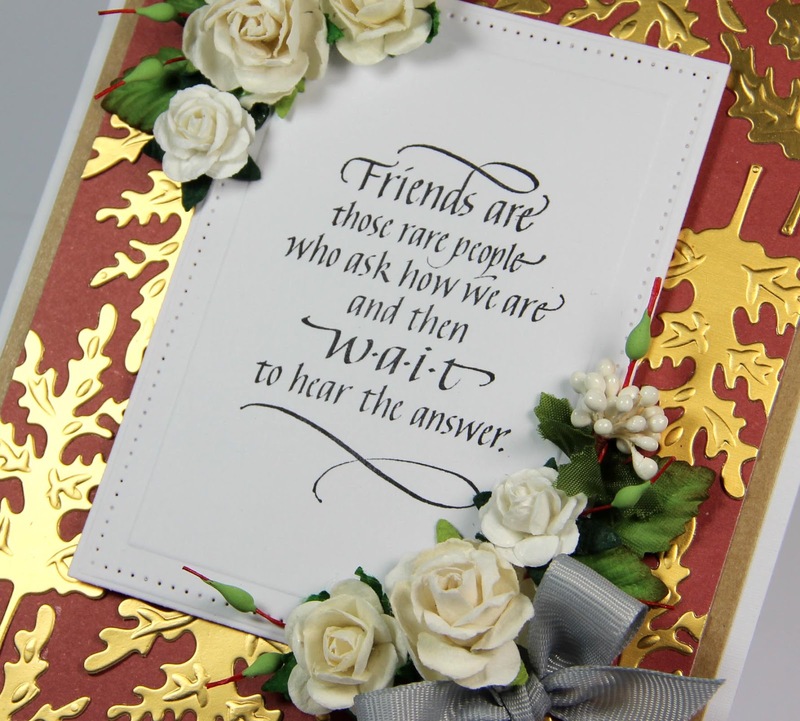 The above sentiment was stamped onto white card stock using VersaMark Ink and silver embossed. 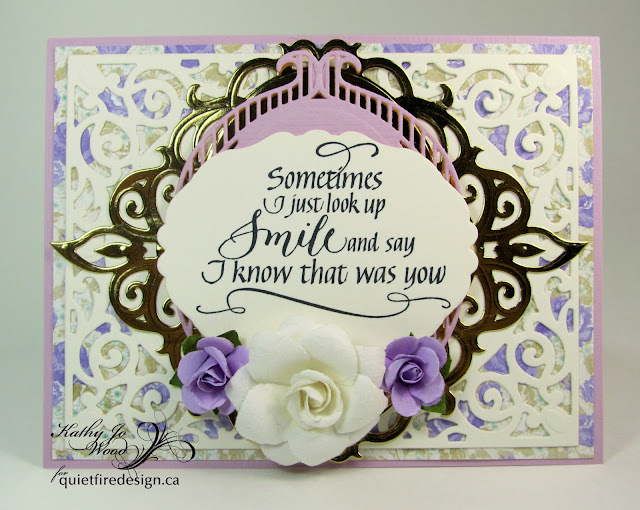 To create a frame, Dotted Scallop Oval Rectangles die set was used to die cut around the sentiment. 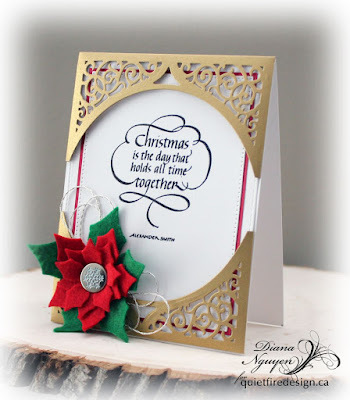 A larger Dotted Scallop Oval Rectangle was used to die cut a silver glittered frame. 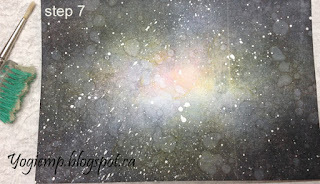 For the background three layers of card stock were used: blue, silver glittered and a piece of snowflake design paper. The Oval Frames were attached with dimensional tape. To bring out the snowflake theme, I used the A Way With Words - Let It Snow die and used only the "snow" die cut. This was die cut using silver glitter card stock. Three large snowflakes were die cut from silver glitter card stock and added around the oval frame. 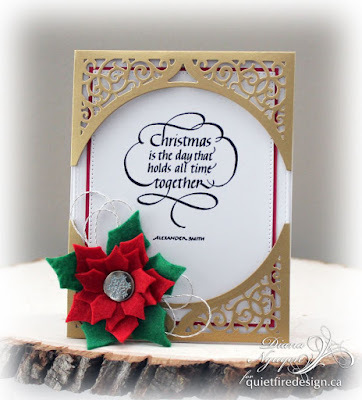 Small silver sticker snowflakes were attached on the oval and around the frame. Glitter Dot Peel Off Stickers were added to the snowflakes. 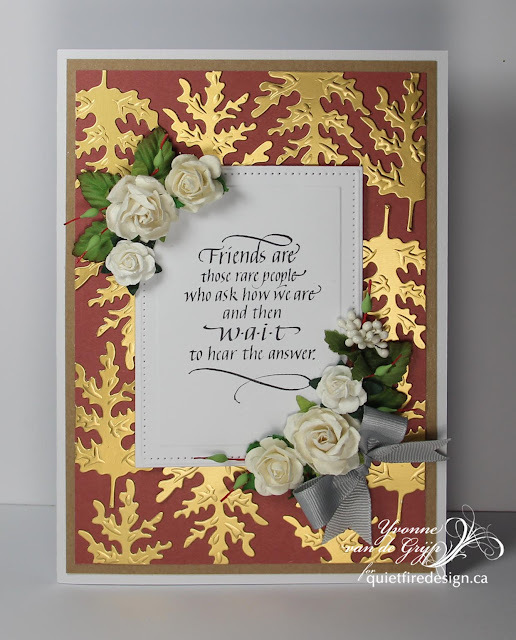 Yvonne here with a card about how precious real friendship is. For the card I used Quietfire Design's stamp "Friends are those rare people". Fitting the season the card is in autumn colours. For the background dull gold leaves were die-cut and glued upon burgundy cardstock. 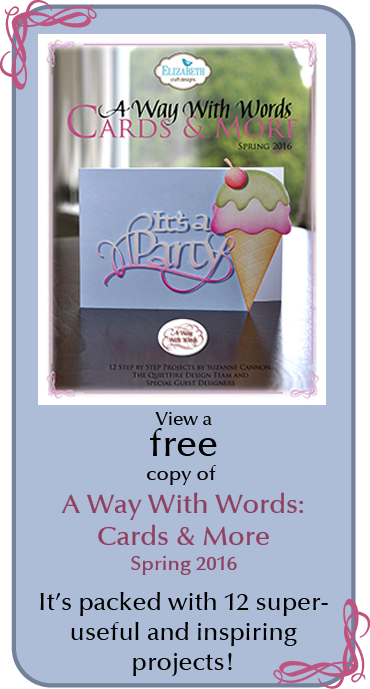 I hope you like the card and I am looking forward to your comments. 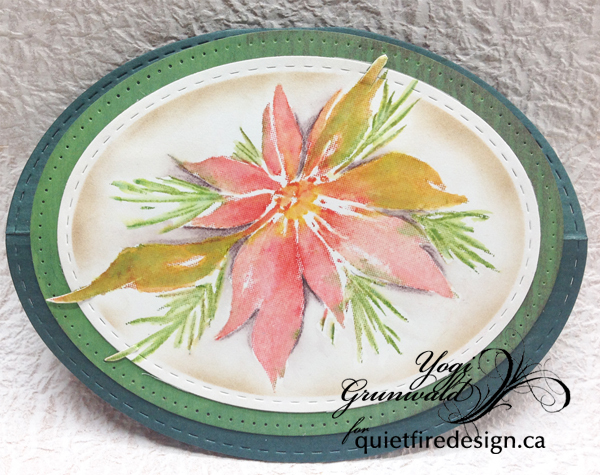 Yogi here today with a tutorial on how I made the "Celestial Sky" and using one of the newest stamps from Quietfire Design. "Sometimes I Just Look Up..." loving this one and the calligraphy contrast of the "smile" in the quote just makes me smile. BIG GRIN. I'm also using part of another quote "I Shut My Eyes..." for the "in my"
This is going to be a long post. 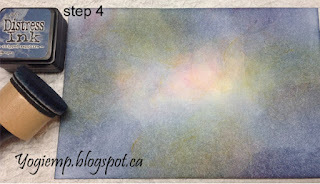 The tutorial is below the card. Click on any image to enlarge. Enjoy. 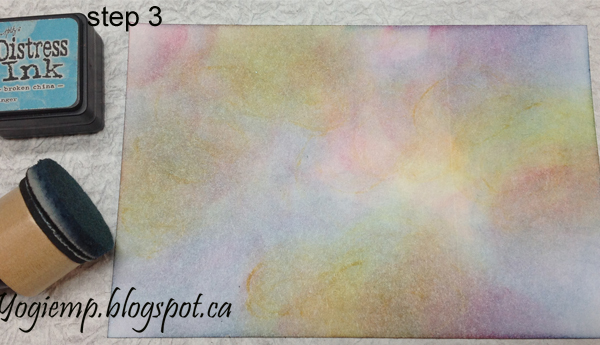 Scored, and folded my gold metallic card to create the easel. Adhered some Sookwang tape to my white cardstock and die cut a star (Spellbinders). 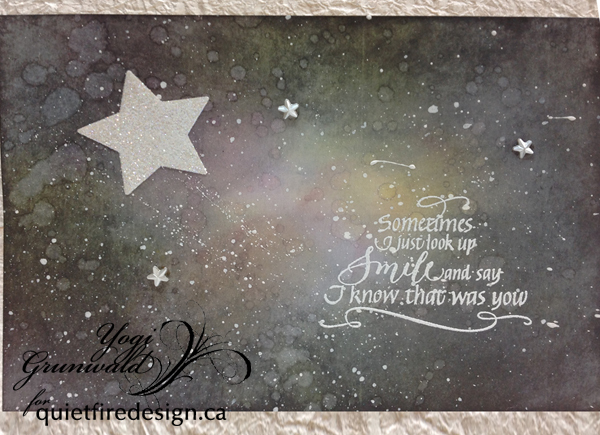 Applied Stickles "Star Dust"dry glitter, then adhered to sky. Stamped the quote using Distress "Picket Fence" and embossing with white embossing powder. 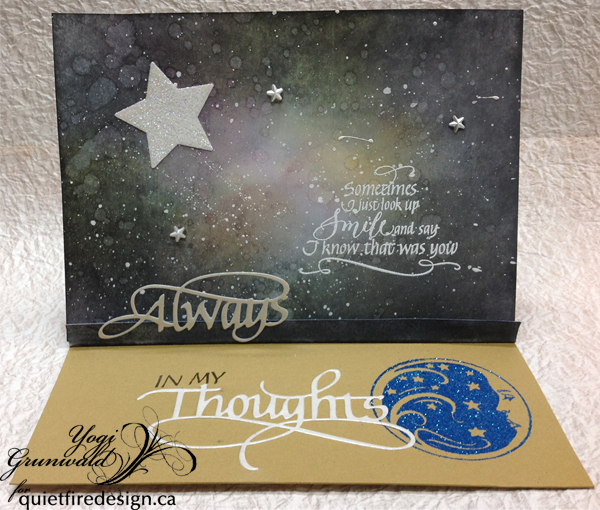 Adhered sky to card front adding some white rhinestone stars. 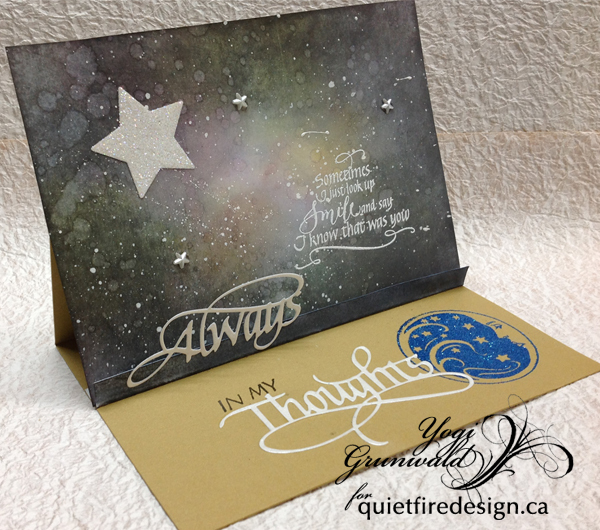 Die cut the words "Always" and "Thoughts" (on Quietfire Design HERE and HERE) from white cardstock, inked with Versamark and embossed with Pearlescent embossing powder. Cut a piece of the white, scored and folded in half, inked the front with Distress "Black Soot" and adhered the word "Always" to the edge, then adhered to floor to act as the stopper. Used a stamp positioner to stamp the "In My" using Versafine Black Onyx and clear embossed.Stamped the moon (Faerie Song) using Versafine "Blue Lagoon" and embossed with Emerald Creek "Blue Sparkle" embossing powder. Adhered the "Thoughts" die cut. Sponge "Mustard Seed" in various places around the edge and working toward the middle on white cardstock. 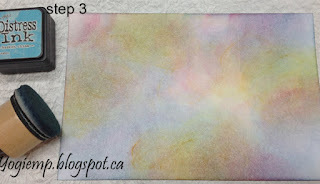 Sponge "Picked Raspberry" over some of the yellow and in various white spots. Sponge "Broken China" all over the edges and towards the middle. 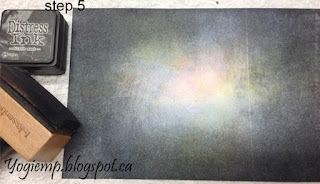 Sponge "Chipped Sapphire" around all the edges and also working towards the center, leaving a lighter area. 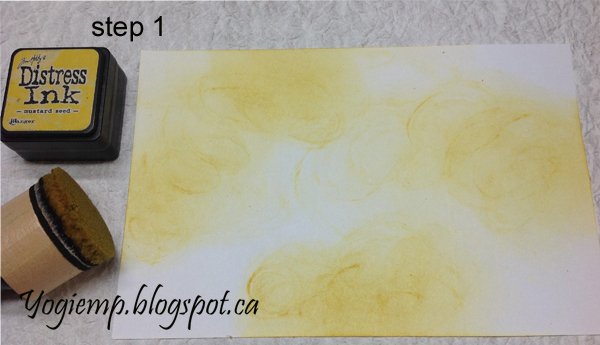 Sponge "Black Soot" heavily in each corner and working around all the edges and towards the center, leaving the center very light. 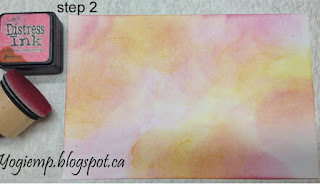 Mix up some white ink or acrylic paint or gesso. I used my watered down Copic White Opaque ink on my craft sheet with a couple more drops of water to make it liquid. Dabbed my toothbrush in the wetness and flicked the ink over my sky to get very tiny dots. Used the paintbrush to flick some larger dots. 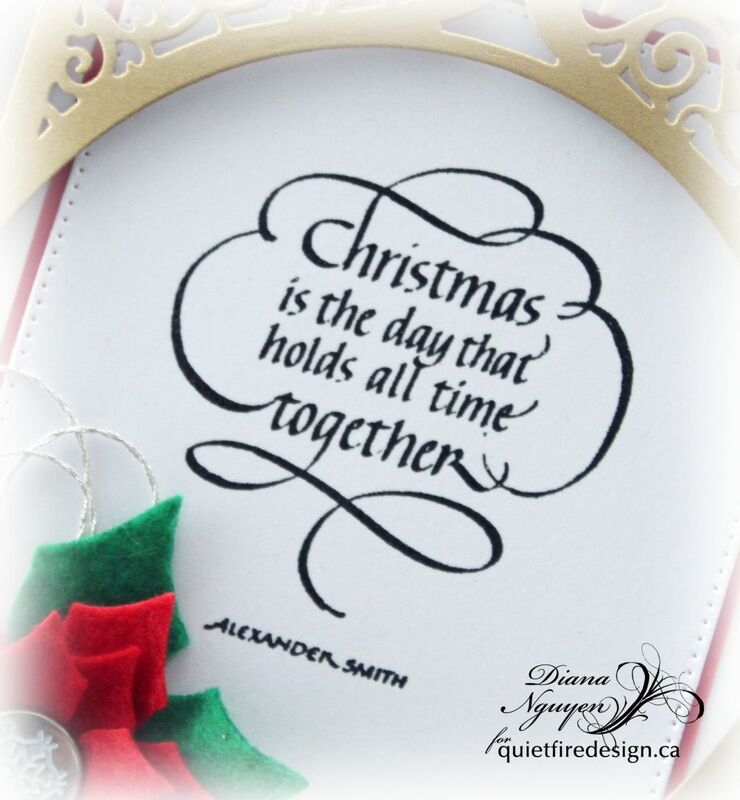 I can't help but go back to the classic colors for Christmas cards - especially when I want to frame something as elegant as this lettered stamp. 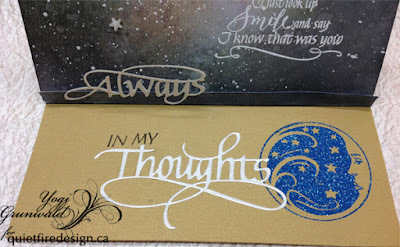 I cut the Spellbinders Swirl Bliss pocket out of metallic gold card stock. 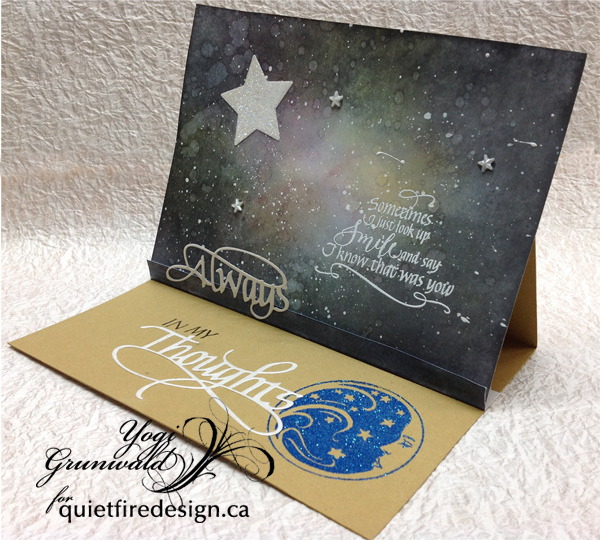 The mounted Christmas is the Day was stamped on black Versafine pigment ink and then clear embossed. After die cutting it out with a pierced rectangle die and matting it with a fine thin red layer, I wrapped the gold pockets and then added a poinsettia die cut out of felt. 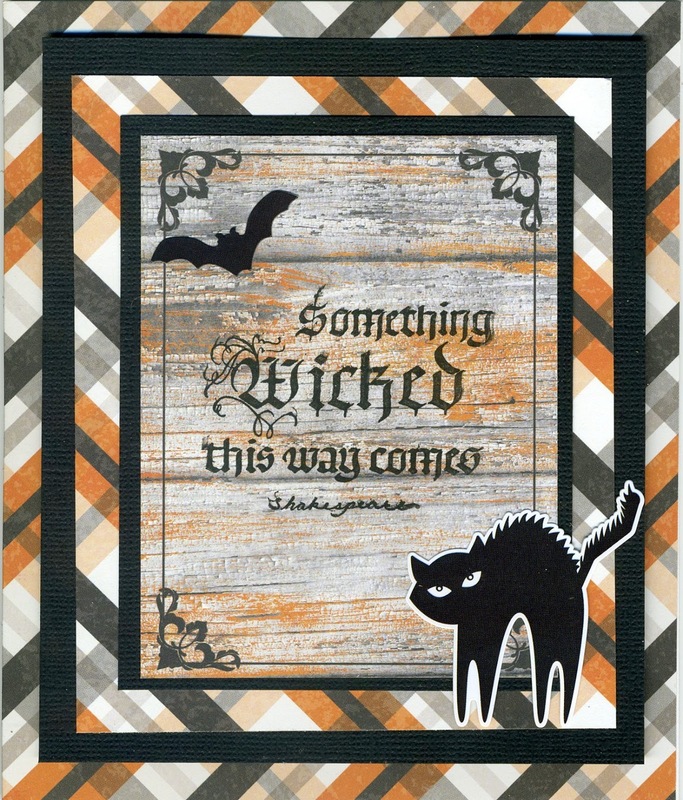 First, a Halloween card was crafted. 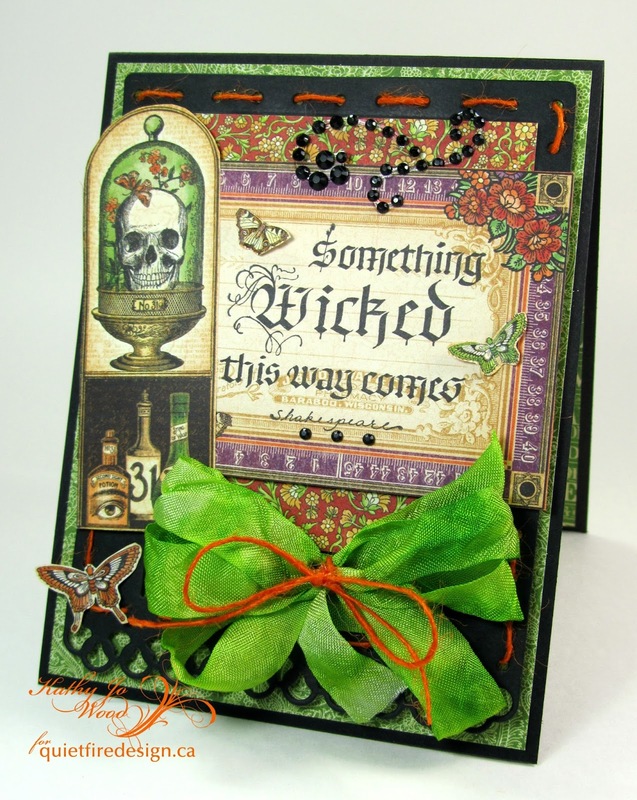 Oh- I so love making Halloween cards and had to much fun creating this one with the Halloween Wicked set! The stamp looks fabulous on the Graphic 45 Rare Oddities collection papers. Seam binding was dyed using Peeled Paint and Mowed Lawn Distress inks. 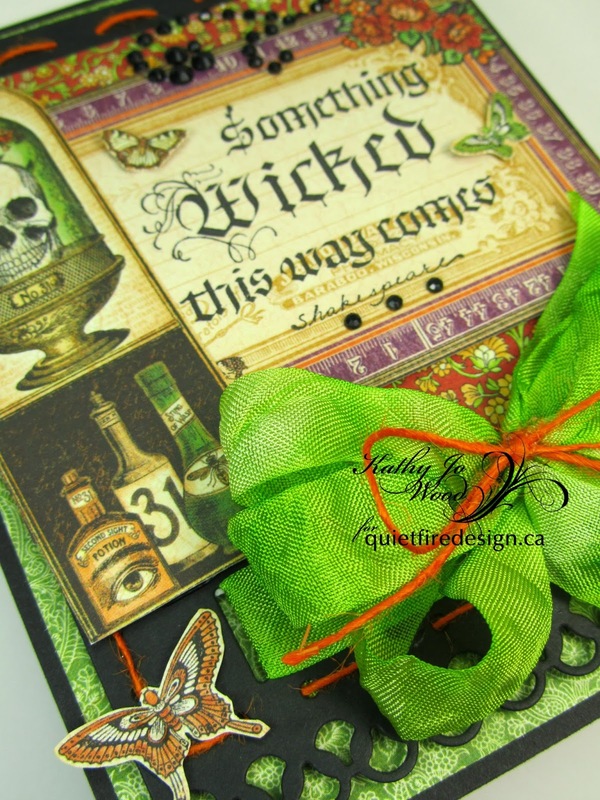 An orange twine bow was added for accent. 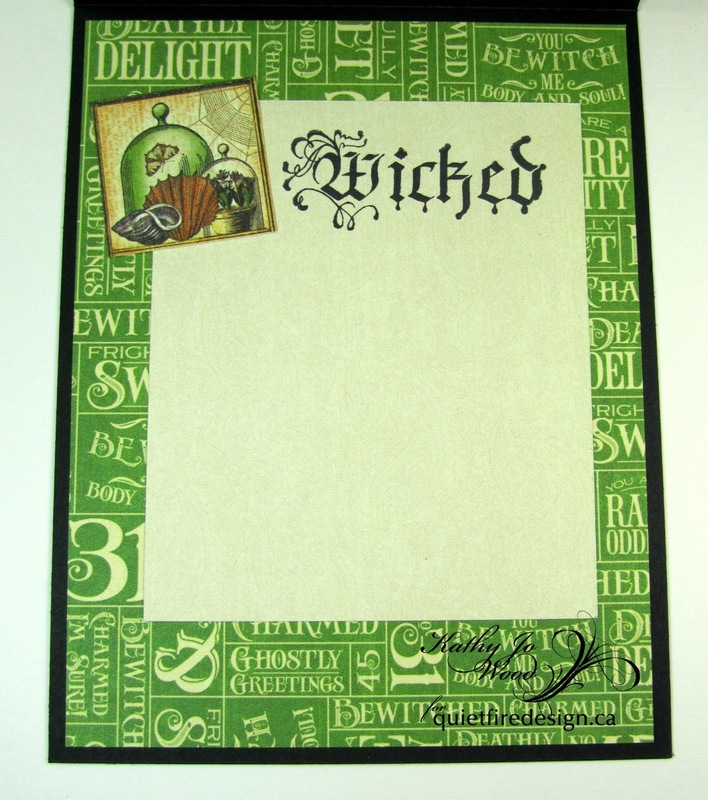 The inside had the ghoulish "Wicked" stamped using more Archival Ink. Aren't the drips from the letters creepy cool? 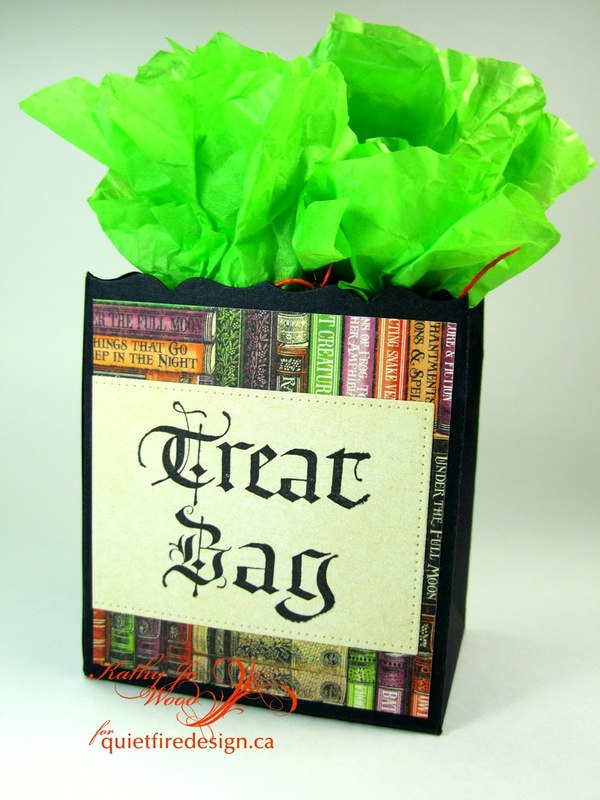 Next were the tissue wrapped candies. The Halloween Wicked set contains several stamps that can be used on candy tags. 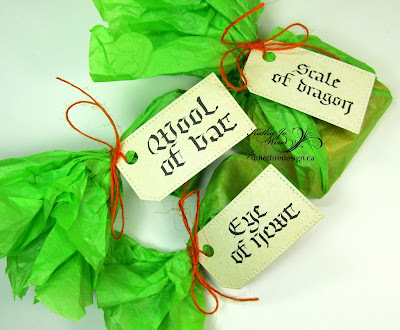 Shown above are three: Wool of bat, Scale of dragon and Eye of newt. After stamping, I die cut them using tag dies and hole punched a corner. Green tissue paper was used to wrap the candies and more orange twine to secure the tags. Thanks for stopping by! I do hope you enjoyed the Halloween set! Hello, Connie Nichol here today with a simple greeting card idea using coffee filters, spray ink, and the "Hope is the Thing with Feathers' Quietfire Design stamp. 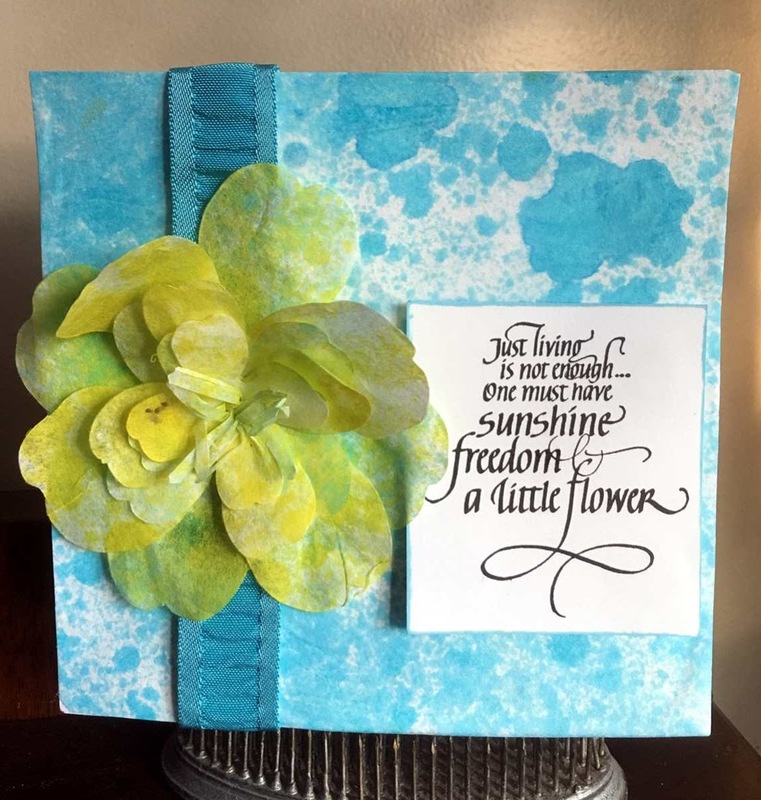 This card was published in the Winter 2016 issue of Creative Scrapbooker magazine as part of an article that looked at using different kitchen supplies for paper crafting. Simply spritz a little bit of ink (I used several complementary colours of Colorbox Spritzer dye ink) onto a round coffee filter and let dry. 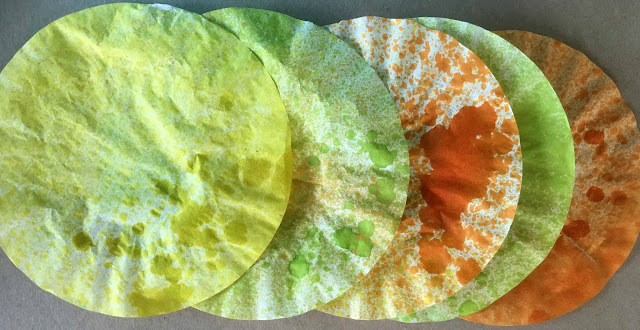 Adhere the coffee filter to a piece of cardstock with a glue stick or spray adhesive, incorporating some wrinkles if you wish. 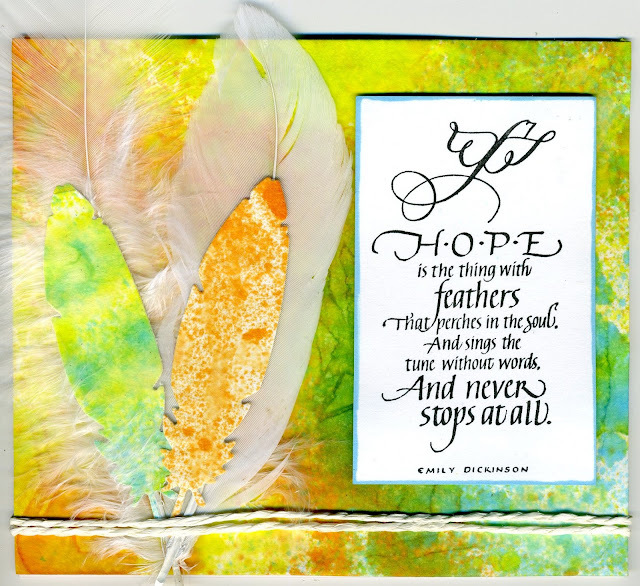 Add the stamped quote and embellish the card with a couple of hand cut or die cut feathers. I also added two white feathers from the dollar store to add some extra contrast. Here's another similar card made with blue spray ink and the Just Living is not Enough stamp. 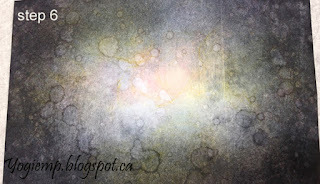 Quick and simple to make, but a little different looking with the inky coffee filter. Just add a bit of ribbon and a little flower made out of some of the extra coffee filters. Thanks for looking and have a wonderful day! 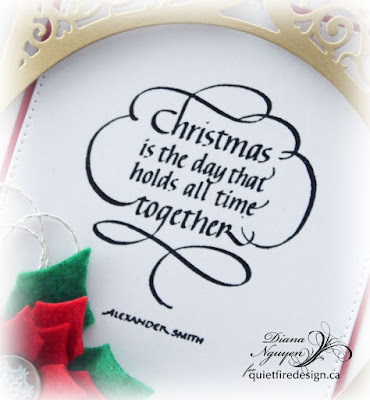 A Way With Words: Merry Christmas!